As the most comprehensive web spot on Romania, our site is intended to be a portal to the World Wide Web's Romanian content. We are committed to providing you interesting information and a series of useful services. Germany was rising and, together with Italy it supported the revisionist states neighbouring Romania; the force policy was successful on the continent and this was marked by the Anschluss, the Munich Pact (1938), the break-up of Czechoslovakia (1939); there was rapprochement between the Soviet Union and the Third Reich; all this led to Romania's international isolation. The von Ribbentrop-Molotov Pact (August 23, 1939) stipulated in a secret protocol the Soviet 'interest' in the Baltic states, eastern Poland and the Soviet similar 'interest' in Bessarabia. When World War II broke out, Romania declared neutrality (September 6, 1939) but she supported Poland (by facilitating the transit of the National Bank treasure and granting asylum to the Polish president and government). The defeats suffered by France and Great Britain in 1940 created a dramatic situation for Romania. 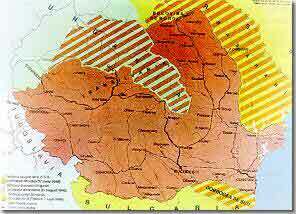 The Soviet government applied Plank 3 of the secret protocol of August 23, 1939 and forced Romania by the ultimatum notes of June 26 and 28, 1940 to cede not only Bessarabia, but also Northern Bukovina and the Hertza land (the latter two had never belonged to Russia). Under the Vienna 'Award' - actually a dictate - (August 30, 1940) Germany and Italy gave to Hungary the north-eastern part of Transylvania, where the majority population was Romanian. Following the Romanian-Bulgarian talks in Craiova, a treaty was signed on September 7, 1940, under which the south of Dobrudja (the Quadrilateral) went to Bulgaria. The serious crisis in the summer of 1940 led to the abdication of King Carol II in favour of his son Michael I (September 6, 1940); equally, it led to General Ion Antonescu's take-over of the government (he became a Marshal in October 1941). In an effort to win support from Germany and Italy, Ion Antonescu joined forces in government with the Iron Guard Movement. The Movement attempted by way of the rebellion of January 21-23, 1941 to take over the entire government and, as a result, it was eliminated from politics. Wishing to get back the territories lost in 1940, Ion Antonescu participated, side by side with Germany, in the war against the Soviet Union (1941-1944). The defeats suffered by the Axis powers led after 1942 to enhanced attempts made by Antonescu's regime, as well as by the democratic opposition (Iuliu Maniu, C.I.C. Bratianu) to take Romania out of the alliance with Germany. On August 23, 1944, Marshal Ion Antonescu was arrested under the order of King Michael I. The new government, made up of military men and technocrats, declared war on Germany (August 24, 1944) and so, Romania brought her whole economic and military potential into the alliance of the United Nations, until the end of World War II in Europe. Despite the human and economic efforts Romania had made for the cause of the United Nations for nine months, the Peace Treaty of Paris (February 10, 1947) denied Romania the co-belligerent status and forced her to pay huge war reparation. payments; but the Treaty recognised the come-back of north-eastern Transylvania to Romania while Bessarabia and Northern Bukovina stayed annexed to the USSR. banks and the transportation means were nationalised (1948), agriculture was forcibly collectivised (1949-1962), the whole economy was developed according to five-year plans, the main goal being a Stalinisttype industrialisation. Romania became a founding member of COMECON (1949) and of the Warsaw Treaty (1955). 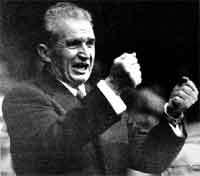 At the death of Gheorghe Gheorghiu-Dej (1965), the communist leader of the after-war epoch, the party leadership, which was later identified with that of the state as well, was monopolised by Nicolae Ceausescu. In a short period of time he managed to concentrate into his own hands (and those of a clan headed by his wife, Elena Ceausescu ) all the power levers of the communist party and of the state system. Romania distanced herself from the USSR (this publicy inaugurated in the 'Statement' of April 1964); the domestic policy was less rigid and there was some opening in the foreign policy (Romania was the only Warsaw Treaty member-state that did not intervene in Czechoslovakia in 1968); all this, as well as the political capital built on such a less Orthodox line were used to consolidate Ceausescu own position, to take over the whole power within the party and the state. 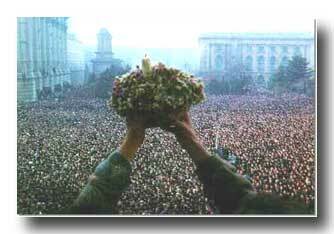 The dictatorship of the Ceausescu family, one of the most absurd forms of totalitarian government in the 20th century Europe, with a personality cult that actually bordered on mental illness, had as a result, among other things, distortions in the economy, the degradation of the social and moral life, the country's isolation from the international community. The country's resources were abusively used to build absurdly giant projects devised by the dictator's megalomania; this also contributed to a dramatic decline of the population's living standard and the deepening of the regime's crisis. Click here for more information about Ceausescu. Under these circumstances, the spark of the revolt that was stirred in Timisoara on December 16, 1989 rapidly spread all over the country and in December 22 the dictatorship was overthrown owing to the sacrifice of over one thousand lives. The victory of the revolution opened the way for a re-establishment of democracy, of the pluralist political system, for the return to a market economy and the re-integration of the country in the European economic, political and cultural space. 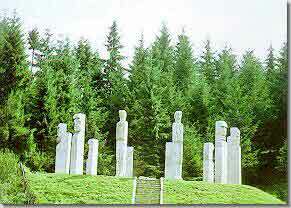 © 1996 - 2012 S.C. Internet Service Romania, S.A.